I was invited to live in a non-profit gallery called Artspace in Downtown New Haven, Connecticut and make artwork that involved the neighbors around the space. 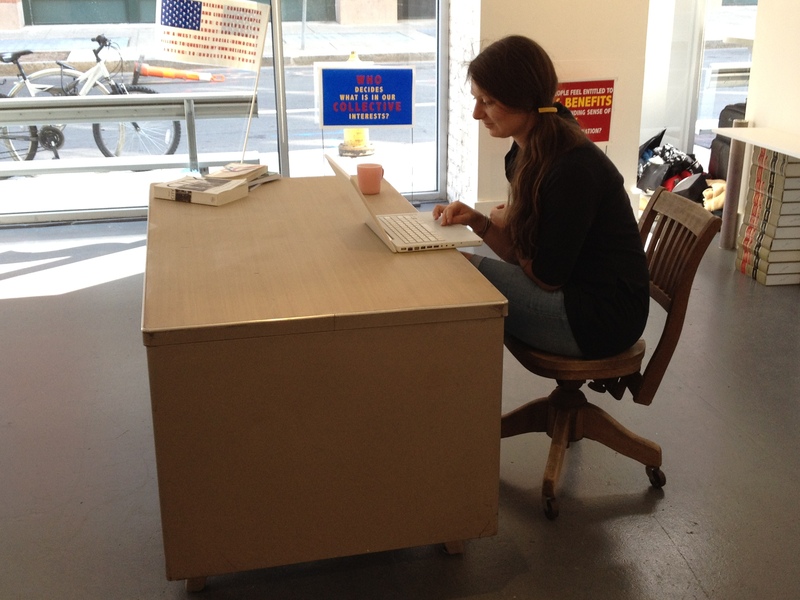 For the last couple of days I’ve been setting up my part of the gallery as a campaign office of sorts, including borrowing a desk from the used office furniture store/secret local history museum down the street. The neighborhood is a confusing mix of fancy architecture firms, abandoned storefronts, yoga studios, noisy clubs and low income housing. New Haven has it’s own particular complicated political history that serves as the model for the failure of urban renewal policies. Since the loss of its manufacturing industries the city has been left with a huge divide between its remaining largest employer, Yale, and the rest of the city, much of which is undereducated and in poverty. Never the less, the city leans heavily Democratic, has had the same Democrat for a mayor for the last 20 years, and the few the Republicans who are around seem to have beliefs that would fit more easily into the national Democratic platform. As a way to get to know what is going on in my temporary neighborhood I went to a meeting for entrepreneurs at a co-working office down the block from the gallery. There I met a man who is working on a project that helps vets start their own small businesses. It is a pilot project started by a disabled woman vet that offers guidance and grants for people who are integrating back into civilian life. He is a vet himself who grew up in New Haven going to inner city public schools where being a white kid made him a minority. He was the son of a pastor and the eldest of six. He said he believed his father had good intentions but it wasn’t an easy childhood and he doesn’t speak with his father at this point. He joined the National Guard while still in High School and put himself through college. On top of his job and school he always volunteered, including working in other inner city communities to try and help kids make it through their own education. He is just finishing his second masters degree and has done two tours of service, one in 2003 and one in 2009. He is a good listener, a careful speaker, and his life story shows he has always had a very strong ethic of caring for others. He feels that there is currently a liberal movement based on ideological values that is trying to move the US away from the constitution and its original godly foundation. He believes that the normalization of gays in the military and in marriage is a social experiment imposed on citizens by the government. He feels that the strain that soldiers live through 24 hours a day is already so high that it is too much to ask them to deal with the added psychological strain of out gay behavior in the military. He sees this issue as being very different from the civil rights movements for women and people of color, in part because he doesn’t see being gay as a natural fact but as a choice, and in his view a sinful choice. I suggested that there might be a time in the near future when science could prove that being gay was a biological characteristic not a cultural trend, but he didn’t respond directly to that point. He has lived away from New Haven for most of his adult life but since recently moving back he says he is glad to have his point of view expanded by living in such a Democratic leaning city. He is proud of being able to be open minded.